Posted Sun 26 Jul, 2015 4:53 PM – Last edited by Solace; Fri 04 Sep, 2015 1:48 PM. We enjoy the benefits of a very varied community, due to this there are only a few rules to follow when using TeamSpeak or STO channel, these follow the principles of the forum itself. Article 4 of The Federation Prime Directive. Whilst the behaviour regulations on the UFP Teamspeak are more relaxed, it is still expected that members use common sense in accordance with these regulations. Please refer to the links below. Notification to all Starfleet vessels, new communication protocols are in effect. 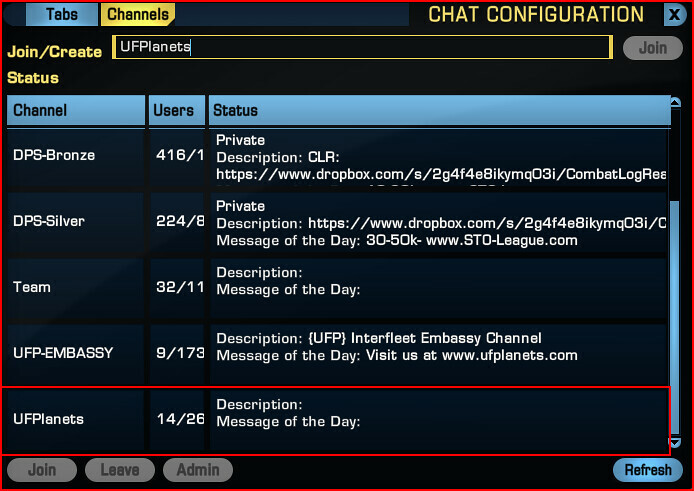 If you are not already aware we have a global chat channel, which we use in all fleet communications, as it crosses with both Klingons and Federation Fleets and allows cross-faction communication. Please follow the below instructions to join this channel. 2) Once this window is open, click on the "Channels" tab on the top of the window. 3a) Once you have created the channel it will appear in the window below (highlighted in the following screenshot) I have other custom channel here as I am a member of several DPS channels and the UFP-Embassy for inter fleet communications. For our purposes I have highlighted the channel we just joined. The following guide will show how to create a new tab and how to configure it. 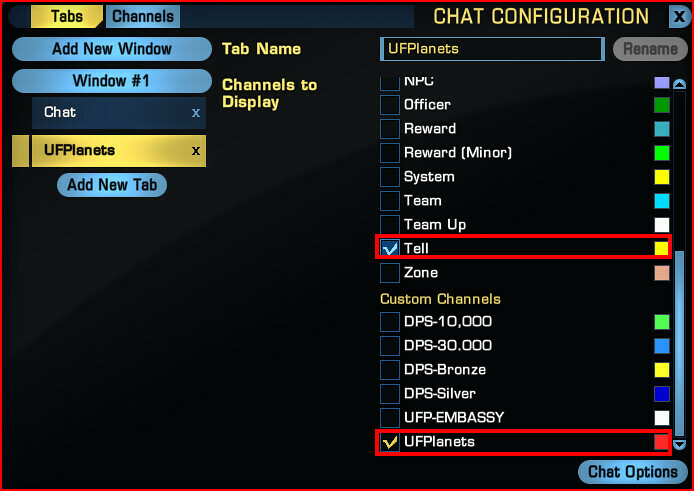 This guide will show you how to 1) set up a new tab that only displays UFPlanets and in Private Messages (Tells), 2) Select which channels will and won't be displayed in a tab, 3) Change the color of text displayed for a particular chat channel (so that we can tell them apart). The image above shows the default tab "Chat". 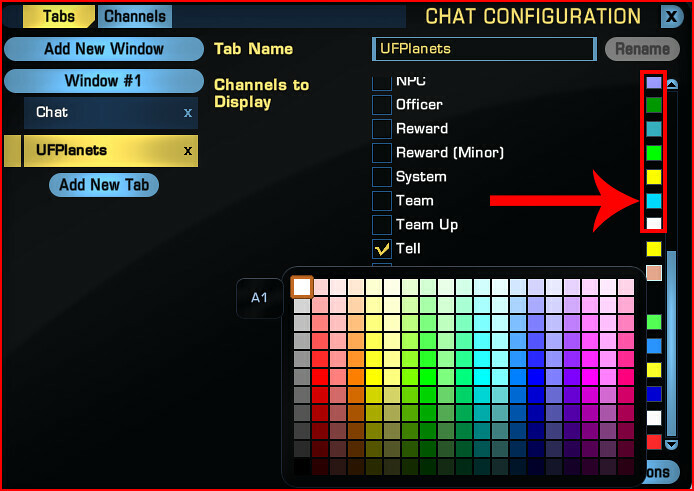 In this section we are going to rename this tab and change the settings so the tab only displays our ingame "Tells" and "UFPlanets". 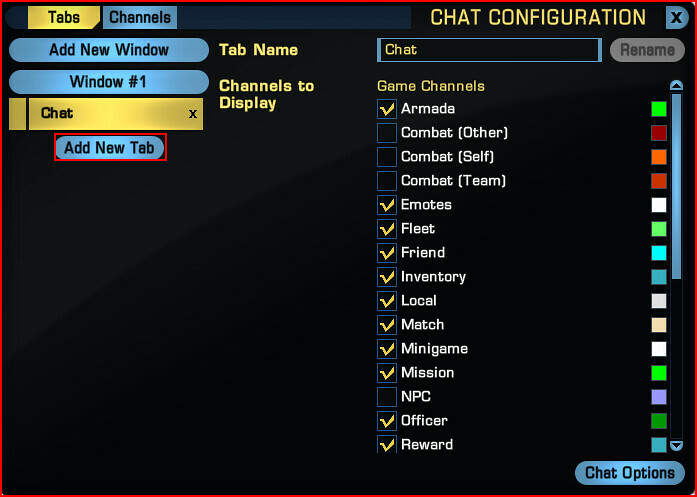 1) Following the guide above, press Esc (Escape) or right click on a tab to open up the chat setting window. 2) Left click the button "New Tab" as shown above. 3) Our new tab has been created, but we're going to want to rename it with a functional name. I chose "UFPlanets". You can choose whatever you wish. Once you've selected a name and typed it into the box, hit the "Rename" button. 4) You should see the new tab we created earlier. They should be checked by default when you add them. If they aren't, check the box next to them until they appear like this. They should be the only channels selected. 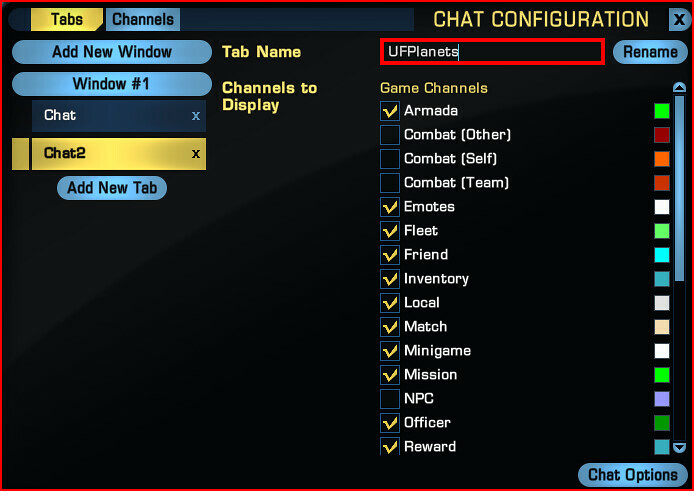 For our purposes I have chosen our custom channel we created in the first guide above UFPlanets and I want my ingame tells to appear in the channel. 5) To show the Tells I receive ingame I select the custom channel by 'ticking' the box next to and then all my tells I receive and send will show in my new tab. 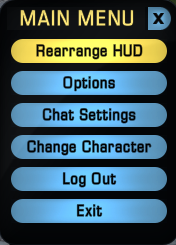 You can do this with custom channels such as UFPlanets. Furthermore you can create dedicated tabs for specific functions. 6) Last but not least! We can change the colour of the text for our custom channel. Next to the custom channel name and 'tickbox' you'll notice a small coloured square. Simply clicking on this square will open up a wide colour palette to choose from. 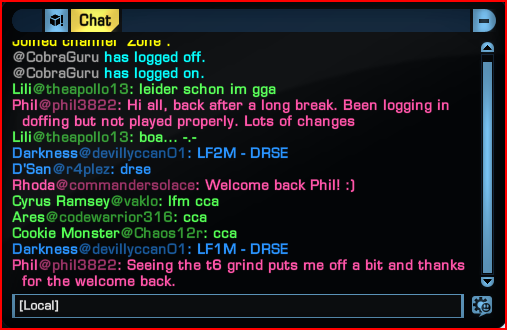 If you have any questions please don't hesitate to contact myself via PM on the forums or any of the HoK or SFO staff.